Processes involved in acid deposition. Note that among the atmospheric pollutants shown, only sulfur dioxide (SO2) and nitrogen oxides (NOx) play a significant role in acid rain. The term acid rain is commonly used to mean the deposition of acidic components in rain, snow, fog, dew, or dry particles. The more accurate term is acid precipitation. "Clean" or unpolluted rain is slightly acidic, because carbon dioxide and water in the air react together to form carbonic acid, a weak acid. Rain acquires additional acidity through the reaction of air pollutants (primarily oxides of sulfur and nitrogen) with water in the air, to form strong acids (such as sulfuric acid and nitric acid). The main sources of these pollutants are emissions from vehicles, industrial plants, and power-generating plants. Acid rain has been shown to have adverse effects on forests, freshwater, and soils, killing off insect and aquatic life forms. It also damages buildings and statues, and may adversely affect human health. These problems, which have increased with population and industrial growth, are being addressed by the use of pollution control equipment that reduces the emission of sulfur and nitrogen oxides. Acid rain was first observed by Robert Angus Smith in Manchester, England. In 1852, he reported the relationship between acid rain and atmospheric pollution. It was, however, not until the late 1960s that scientists began widely observing and studying the phenomenon. Harold Harvey of Canada was among the first to research a "dead" lake. In the United States, public awareness of the problem was heightened in the 1990s, after the New York Times promulgated reports from the Hubbard Brook Experimental Forest in New Hampshire of the myriad deleterious environmental effects resulting from acid rain. The most significant gas that leads to acidification of rainwater is sulfur dioxide (SO2). In addition, emissions of nitrogen oxides, which are oxidized to form nitric acid, are of increasing importance due to stricter controls on emissions of sulfur-containing compounds. It has been estimated that about 70 Tg(S) per year in the form of SO2 comes from fossil fuel combustion and industry, 2.8 Tg(S) per year comes from wildfires, and 7-8 Tg(S) per year comes from volcanoes. The coal-fired Gavin power plant in Cheshire, Ohio. Sulfur and nitrogen compounds are the principal causes of acid rain. Many of them are generated by human activity, such as electricity generation, factories, and motor vehicles. Coal power plants are among the most polluting. The gases can be carried hundreds of kilometers in the atmosphere before they are converted to acids and deposited. Factories used to have short chimneys to release smoke, but because they polluted the air in their nearby localities, factories now have tall smokestacks. The problem with this "solution" is that those pollutants get carried far off, releasing gases into regional atmospheric circulation and contributing to the spread of acid rain. Often deposition occurs at considerable distances downwind of the emissions, with mountainous regions tending to receive the most (because of their higher rainfall). An example of this effect is the low pH of rain (compared to the local emissions) that falls in Scandinavia. Many aqueous reactions oxidize sulfur from S(IV) to S(VI), leading to the formation of sulfuric acid. The most important oxidation reactions are with ozone, hydrogen peroxide, and oxygen. (Reactions with oxygen are catalyzed by iron and manganese in the cloud droplets). Wet deposition of acids occurs when any form of precipitation (rain, snow, and so forth) removes acids from the atmosphere and delivers it to the Earth's surface. This can result from the deposition of acids produced in the raindrops (see aqueous phase chemistry above) or by the precipitation removing the acids either in clouds or below clouds. Wet removal of both gases and aerosol are both of importance for wet deposition. Acid deposition also occurs via dry deposition in the absence of precipitation. This can be responsible for as much as 20-60 percent of total acid deposition. This occurs when particles and gases stick to the ground, plants, or other surfaces. Chart showing differing levels of acidity in water tolerated by a variety of species. Both the lower pH and higher aluminum concentrations in surface water that occur as a result of acid rain can cause damage to fish and other aquatic animals. At pH levels lower than 5, most fish eggs will not hatch, and lower pH levels can kill adult fish. As lakes become more acidic, biodiversity is reduced. There has been some debate on the extent to which man-made causes of lake acidity caused fish kills - for example Edward Krug determined that acid rain was an environmental nuisance, not a catastrophe, and even that acid rain might not be the cause of lake acidity. Soil biology can be seriously damaged by acid rain. Some tropical microbes can quickly consume acids but other microbes are unable to tolerate low pH levels and are killed. The enzymes of these microbes are denatured (changed in shape so they no longer function) by the acid. Acid rain also removes minerals and nutrients from the soil that trees need to grow. Effect of acid rain on a forested area of the Jizera Mountains, Czech Republic. Acid rain can slow the growth of forests, cause leaves and needles to turn brown and fall off and die. In extreme cases, trees or whole acres of forest can die. The death of trees is not usually a direct result of acid rain, but it often weakens trees and makes them more susceptible to other threats. Damage to soils (noted above) can also cause problems. High altitude forests are especially vulnerable as they are often surrounded by clouds and fog which are more acidic than rain. Other plants can also be damaged by acid rain but the effect on food crops is minimized by the application of fertilizers to replace lost nutrients. In cultivated areas, limestone may also be added to increase the ability of the soil to keep the pH stable, but this tactic is largely unusable in the case of wilderness lands. Acid Rain depletes minerals from the soil and then it stunts the growth of the plant. Some scientists have suggested direct links to human health, but none have been proven. However, fine particles, a large fraction of which are formed from the same gases as acid rain (sulfur dioxide and nitrogen dioxide), have been shown to cause problems with heart and lung function. 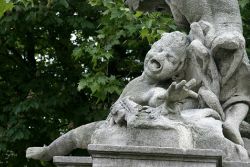 Statues are damaged by acid rain. Acid rain can also cause damage to certain building materials and historical monuments. This is because the sulfuric acid in the rain chemically reacts with the calcium compounds in the stones (limestone, sandstone, marble, and granite) to create gypsum, which then flakes off. This is also commonly seen on old gravestones where the acid rain can cause the inscription to become completely illegible. Acid rain also causes an increased rate of oxidation for iron, causing damage to metal structures and monuments. In the United States and various other countries, many coal-burning power plants use flue gas desulfurization (FGD) to remove sulfur-containing gases from their stack gases. An example of FGD is the wet scrubber, which is basically a reaction tower equipped with a fan that passes hot smoke stack gases through the tower. Lime or limestone in slurry form is also injected into the tower to mix with the stack gases and combine with the sulfur dioxide present. The calcium carbonate of the limestone produces pH-neutral calcium sulfate that is physically removed from the scrubber. In other words, the scrubber turns sulfur pollution into industrial sulfates. In some areas, the sulfates are sold to chemical companies as gypsum when the purity of calcium sulfate is high. In others, they are placed in landfills. However, the effects of acid rain can last for generations, as the effects of pH level change can stimulate the continued leaching of undesirable chemicals into otherwise pristine water sources, killing off vulnerable insect and fish species and blocking efforts to restore native life. A number of international treaties have been signed regarding the long-range transport of atmospheric pollutants. One example is the Sulphur Emissions Reduction Protocol under the Convention on Long-Range Transboundary Air Pollution. A more recent regulatory scheme involves emissions trading. In this scheme, every current polluting facility is given an emissions license that becomes part of capital equipment. Operators can then install pollution control equipment, and sell parts of their emissions licenses. The intent here is to give operators economic incentives to install pollution controls. ↑ Distilled water, which contains no carbon dioxide, has a neutral pH of 7. Liquids with a pH less than 7 are acidic, and those with a pH greater than 7 are alkaline (or basic). ↑ Acid rain. NASA Glossary. Retrieved June 13, 2018. ↑ H. Berresheim, P. H. Wine, and D. D. Davies, "Sulfur in the Atmosphere." In Hanwant B. Singh (ed. ), Composition, Chemistry and Climate of the Atmosphere (Wiley, 1995, ISBN 978-0471285144), 251-307. ↑ William Anderson, Acid Test: Edward Krug Flunks Political Science. The Reason Foundation, January 1992. Retrieved June 13, 2018. ↑ H. Rodhe, et al., "The Global Distribution of Acidifying Wet Deposition" Environmental Science & Technology 36(20) (2002): 4382-4388. Retrieved June 13, 2018. ↑ 6.0 6.1 6.2 Effects of Acid Rain EPA. Retrieved June 13, 2018. National Acid Precipitation Assessment Program Report - a 98-page report to Congress. U.S. Geological Survey - What is acid rain? This page was last modified on 25 June 2018, at 22:34.